Unlike most youth baseball organizations that have to struggle to find places to practice, the Bandits have access to their own indoor facilities for year-round training. Each Bandits team utilizes a climate controlled indoor baseball facility the contains two complete infields, batting cages and pitching mounds. In addition, construction is underway for the Bandits new 29 acre baseball complex that includes twelve diamonds (two of which that meet high school regulation). 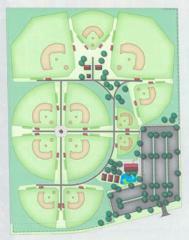 These fields will be available for team practices and will be game-ready in 2018. For additional details on our facilities, please contact us. The Bandits are proud to announce that construction is now underway for its new 27 acre baseball complex which will feature 12 diamonds, including 2 high school diamonds. Fields will be available for practice and ready for game play in 2017.